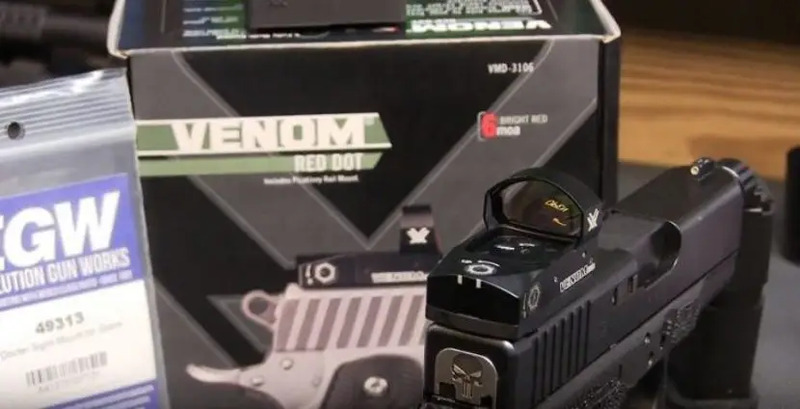 Vortex Venom VS Trijicon RMR - Best Comparison in 2019 April! The houses of Vortex and Trijicon are major forces in the gun optics market. Both these formidable fabricators of high-end optics fabricate a number of magnificent models including riflescopes, red dots, rangefinders, binoculars, spotting scopes, tripods and monocular as well as an assortment of gear and accessories. In this review, I take the Venom Red Dot 6 MOA and compare it to the RMR Type 2 Adjustable 6.5 MOA (RMR7) Red Dot. The final decision is up to you to decide which device is the best one for your needs. 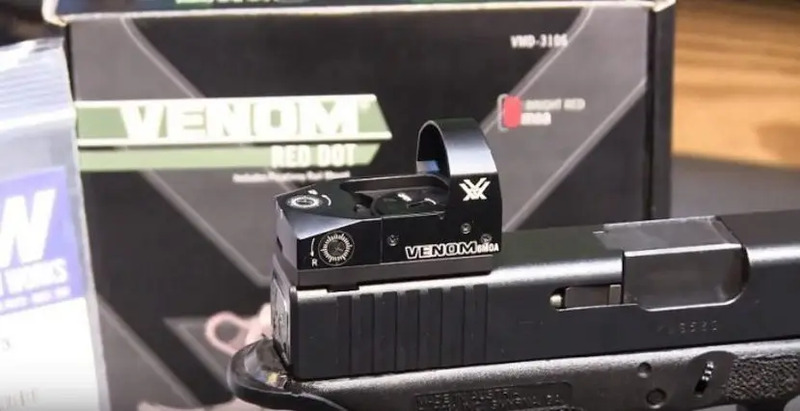 This is the VENOM® RED DOT 6 MOA Dot sight, and it comes with some formidable features including a precision machined and hard anodized aluminum housing, with a top-loading battery replacement option. As such, you don’t need to replace the battery by removing the sighting, and this is a major advantage of this sight. On the flip side, it uses a CR 1632 battery, which is not as popular as the standard CR 2302. On the Venom, the power and dot intensity controls are recessed and located on the left side of the unit. You get 1 MOA windage and elevation adjustments, which makes it extremely versatile over many distances and it comes with a 1.6-ounce weaver/Picatinny mount. The RMR Type 2 is a 6.5 MOA sight that comes with a patented housing and is designed for slide ride handguns. The upgraded electronics are mil.spec. and are suitable for the most rugged and tactical of conditions, and is used for military and law enforcement applications. The RMR® Type 2 Adjustable LED sight makes for easy illumination control. This is key when working in changing environmental conditions, such as transitioning from indoors to outdoors, or from dark to light locations. The easy-to-use buttons let you toggle between manual and automatic modes, adjust the illumination brightness, and power down the RMR. The manual mode will give you control over the optics for 16 ½ hours after selecting manual. After powering down, when you restart the sight, the optics will restart in automatic. 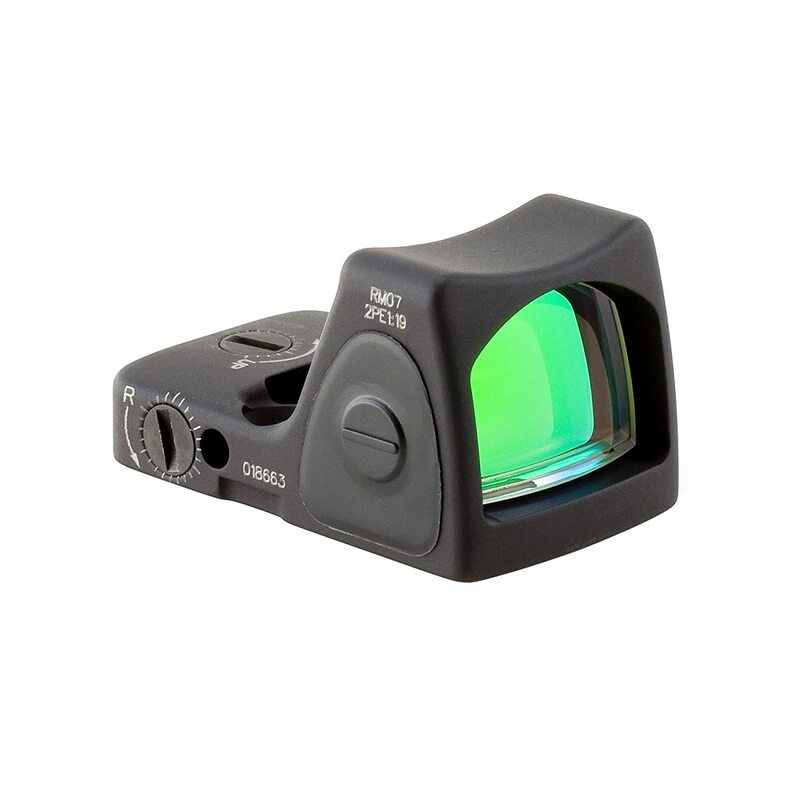 The RMR models are compatible with night vision devices. This 6.5 MOA dot is the biggest dot available in the LED and Adjustable LED operated models. This sights length is 45 mm, and it weighs 1.2 ounces with the battery. The battery is located under the sight, so you need to disassemble the unit to replace the battery. This models body is made from forged aluminum that was precision machined and given a hard anodized coating. The battery used is a standard R 2032. Battery Life is over 4 years of continuous use at setting 4 of 8. The RMR Type 2 is the top of the Trijicon red dot line, as well as the gold standard of all handgun mounted sights. This is also nearly double the price of the Venom. This model comes with a Super Rugged housing that is the most robust casing you will find on the market in this category. With this, there is an effect on the size of the viewing window, which is slightly reduced. The battery life is unsurpassed by anyone, and it blows away all the competition with a magnificent 4 years of continuous use, which is probably only going to happen if it’s held by a dummy. If you want absolute waterproofing you need to invest in a sealing plate and the battery replacement that does happen once every 4 years requires you to remove the sight to replace the battery. The night vision compatibility is a stand out since it’s the only one that works with NV. 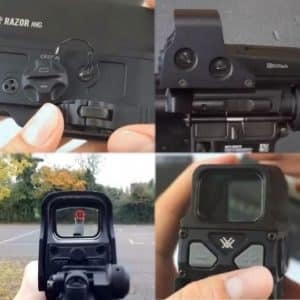 Overall the RMR not only looks high quality, it feels high quality, and it does everything you would expect from the Rolls Royce of red dot sights. The buttons are placed in very convenient positions, and the adjustment is extremely tactile. 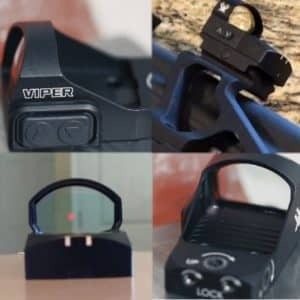 Their glass is also the bluest tinted there is, and the final clincher is that this sight is the most compatible to the largest array of handguns on the market. The lowest brightness setting makes the red dot a perfect laser-like fix on any target and to sum up on this model I have to say that it is definitely the most rugged and robust red dot in this category fo sights, The battery lifespan is incredible, and the night vision compatibility gives out the least reflection. However, it is the most expensive model there is. 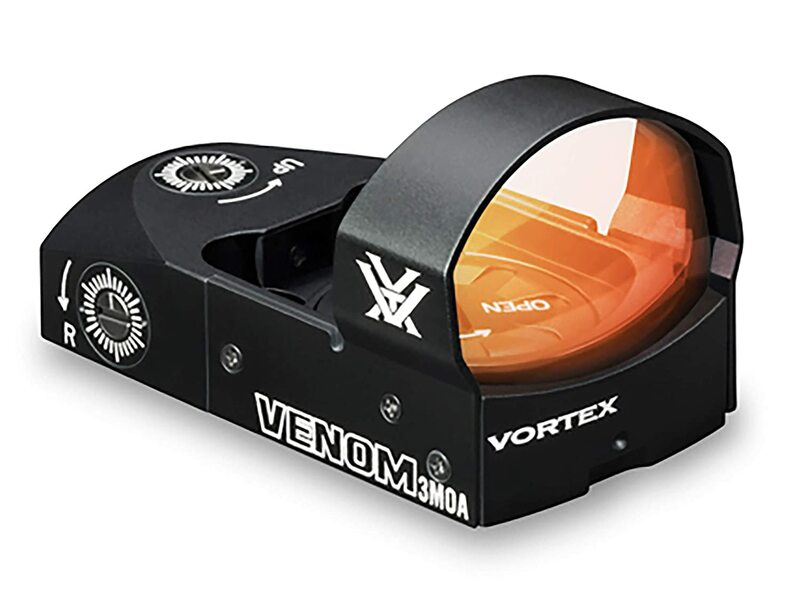 The Vortex Venom is a lightweight when compared to the RMR, but it gives off a lot of functionality and performance at a much easier price tag. This is a very popular model and demands a lot of respect since it is used across many applications by a large percentage of gun users. 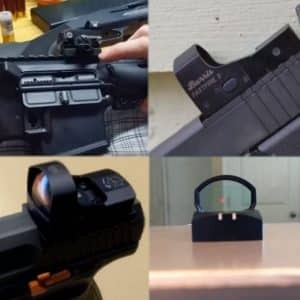 To start off with, the glass quality on this model does not step down from that of the RMR, and the adjustment buttons are much easier to manage. You get to cycle through 10 brightness settings. With this, there is one drawback, the lowest brightness level is still too bright for night vision use. The auto brightness function is activated when you hold the button for 3 seconds, and the auto-shutoff feature activates after 14 hours. Battery life is an acceptable standard of 150 hours at the brightest level, and 30,000 at the lowers, but in the world of true life and not specifications, its somewhere in the middle of both numbers, which is acceptable. What stands out here and gives an advantage is that when you do need to change the battery, you do so on the fly since its top loaded. In terms of compatibility, the sight comes with an extra-low Picatinny mount. This means it can go on most handguns as well as rifles too. However it doesn’t have a lot of pre-milled custom slides, so it doesn’t reach the same level of compatibility as the RMR. Summing up the Venom I have to state that has the lighter and lower profile with the Picatinny rail and has a nice clear glass with top loading battery option for fast battery replacement. The 14 hours shut off is good too, and the 10 brightness settings are ideal. The jury is in, and the judge is back, the RMR does outperform in ruggedness and battery life, as well as in night vision compatibility. It also suits more models than the Venom. However, the price is so high that for what most gun users need, the Venom is more than enough and outperforms in simplicity and control. 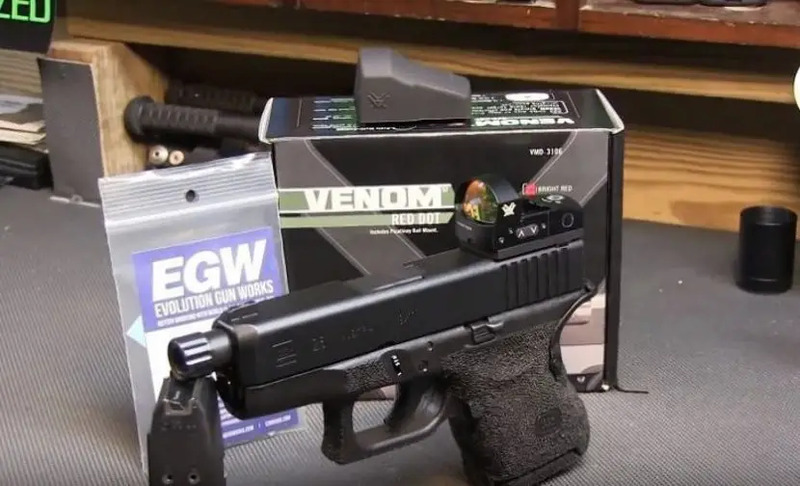 The bottom line is this, the differences between the two don’t warrant the price difference, as such the Vortex Venom is my preferred choice since I can get two for the price of one RMR, and since I own more than one pistol, that’s a big big plus.